There are certain times in life when your car is simply not big enough. Maybe you’re about to embark on a big holiday or perhaps the boot is already full of dogs. Whatever the scenario, this is the time when you need to choose between a trailer and the best car top carrier of 2019. It may seem tempting to get yourself a trailer but in reality, this can be more cumbersome than a rooftop cargo box. You’ll need a tow bar, it will slow you down and you may even need to upgrade your license. The car top carrier is a much simpler way to maximize the space in your vehicle. But the choice of products is surprisingly huge! You may wish to select a soft cargo box or the more traditional hard shell. Both have their place; it simply depends on what suits your needs and your budget. 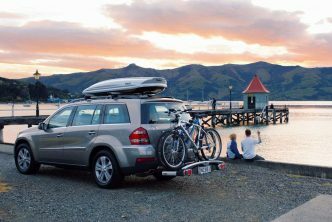 You can get some top tips in our ultimate guide to choosing a car top carrier which is listed later in this article. Fortunately, we can make your choice easier by showing you the 10 best car top carriers of 2019. No rack – this means you don’t need to have roof bars to fasten the car top carrier to your vehicle. 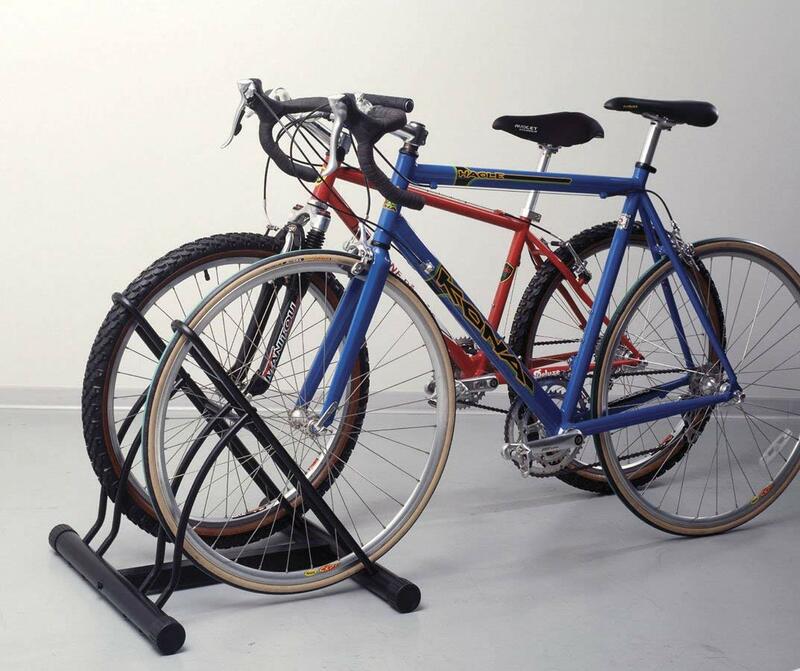 It doesn’t mean that you don’t get a rack with it; you don’t get a rack with any of these! Cubic Feet – the standard measurement of the space inside your cargo box. It is simply the length multiplied by the height and width. Over Flap – If your soft cargo box has one of these then it will protect the zip from the elements; potentially preventing your belongings from getting wet. Ratchet Strap – A ratchet mechanism is used to tighten the strap. This is generally easier and more likely to stay tightened. The alternative is buckles or clasps and a buckle style adjustment which can be fiddly. Bi-Side Opening – Some boxes open at the rear, other open at one side and some even have bi-sided openings. These use a special mechanism to allow you to unlock it from either side and access your belongings. It is designed as a safety feature so that you are always away from the cars; no matter what country you are driving in. Aerodynamic – The smoother the movement of air over your vehicle the more aerodynamic it is. This is a good thing as it reduces fuel consumption and the likelihood of the box making a noise while you drive. 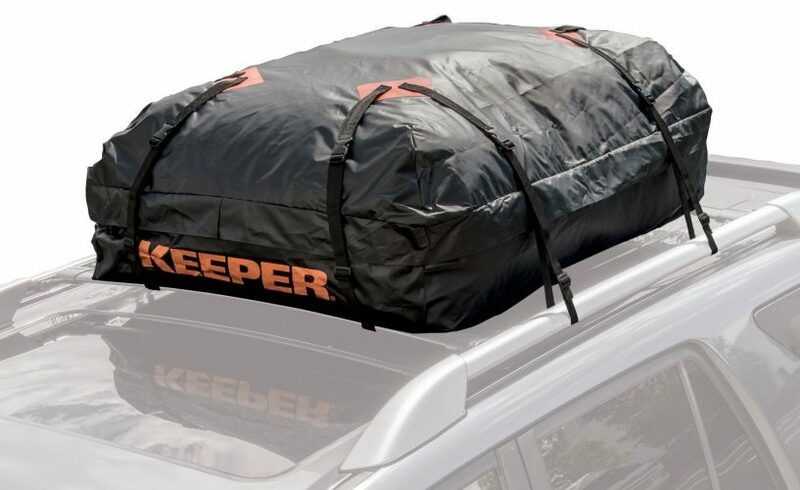 The Keeper 07203 is designed to fit any roof rack, whether factory designed or a custom after market version. It offers and impressive 15 cubic feet of space and can be fitted in minutes. This soft cargo box has attachments on all four sides; ensuring it is securely fastened. The cargo bag itself rests on your roof. You then utilize the 2 clasp style straps on each of the four sides to secure the soft cargo box to your roof. Once the clasps are fastened you simply tighten the buckles to ensure the load is in the center of your roof and will not move. It really is that simple! It is worth noting that if you only fasten the load on two of the four sides or do not utilize all the straps you may experience movement while driving. The Keeper 07203 is 44” x 34” x 17”. But this shape is not rigid; making it possible to put odd sized loads in. Of course, if you flex the sides too much you will damage them. This particular car top carrier is made of rubber laminated nylon. This means it is exceptionally durable and waterproof. That’s important if you’re driving a long distance and don’t know what weather you’ll face! Another key feature is the ability to flatten and roll the cargo box when not in use. It can be folded as small as 8” x 5” by 2”! That means you can easily remove it when you reach your destination and store it until you need it again. The cargo box weighs just 5.25 pounds; you’ll have no difficulty getting it onto the roof. There is a covering flap which protects the zip from the elements. Make sure you use this; it really works! The Keeper 07203 is a soft cargo box. This means it will show signs of wear and tear over time. In fact, you’ll probably notice some small tears appearing after a long road trip. It is realistic to expect it to last 5 or 6 thousand miles before needing replacing. However, considering the low cost of this car top carrier you may not consider this a downside. The softness and flexibility of this cargo box mean that you’ll notice increased wind resistance and possibly noise in your vehicle. This will affect the handling of your car. The material gives, creating resistance pockets instead of a clean line for the air to flow over. In turn, this is likely to cause you to use more fuel. You should also be aware that the bag is fastened with a double zipper. These can be locked together to deter people from helping themselves to your luggage. Unfortunately, the padlock is small and the material is soft; someone could easily cut their way into your car top carrier and remove your belongings. Even if you’re just stopping overnight you’ll probably prefer to empty it first; this can be a little inconvenient. The RoofBag is made in the USA and comes with heavy-duty straps to provide you with peace of mind when using it. The cargo box is guaranteed not to have any toxic or harmful chemicals. Just like the Keeper 07203, it is a soft cargo box with 15 cubic feet of space. It’s an excellent choice if you have no roof rack; although you will still need roof bars. It is also worth noting that there is a premium version of this product. It uses tripe seals and comes with a 2-year warranty to ensure the best possible protection against all weather. All RoofBags are waterproof thanks to the heavy duty canvas which has been specially treated on both sides to deflect water. No matter how long the journey you can confidently put your items in this car top carrier and know they will get to your destination safely and dry. The 11 offers 11 cubic feet of space and will fit on any vehicle. It should comfortably carry 4 medium suitcases. The 15 gives you 15 cubic feet of space and fits a full-size sedan, SUV or even your van. This bag is made from double coated abrasion resistant vinyl; which will help it last for many trips even in seriously inclement weather. It is designed to work well in snow, sand and even hail. 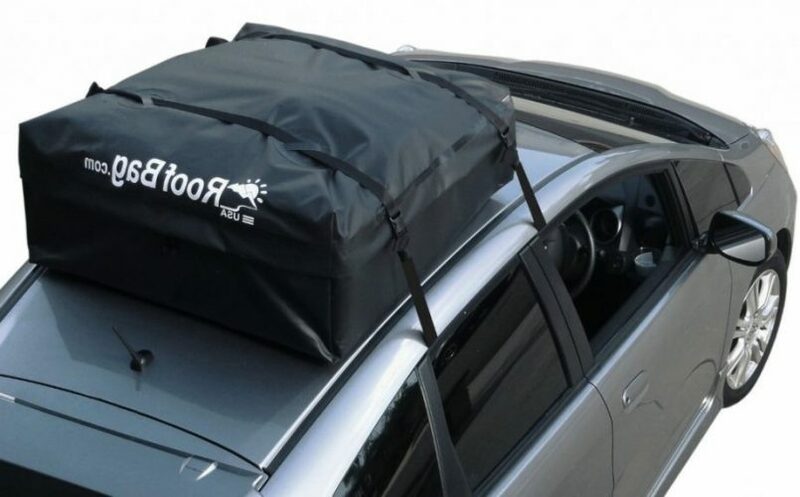 The RoofBag soft cargo box is designed to be aerodynamic; although it is worth noting that for this to be fully effective the bag should be full. This will allow it to retain its shape while you drive. Fitting is simple but it will depend on what roof bars you have on your vehicle. Choose the no rack option when you buy and it will come with heavy duty straps which you pass through your vehicle; before you close the doors. These can then be adjusted to hold the bag securely on your roof. 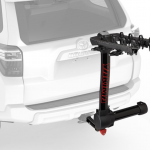 You’ll need to choose the rack option and then attach the provided straps to the side rails on your vehicle. There are 2 on each side to help ensure the bag does not move in transit. You’ll still need the rack option but installation involves turning the bag so that you can attach the straps at the front and back of it. You can add extra straps across the width of the bag but they are not necessary to hold it into place. It is worth noting that the straps are designed in the same way as seatbelts and are able to accommodate loads up to 3,000 pounds. You won’t be carrying weights that heavy! Even the smaller version of this product may not fit onto a small four-door car without a roof rack. You can not fit it to a 2 door vehicle as there is no opening for the second strap. If you have a small 4 door vehicle then you may struggle to get enough distance between the straps; particularly if you have small doors. Although the straps are strong it is advisable to use an additional strap to ensure the bag is held in place properly. This is especially the case if you only have sidebars and not cross bars. As normal with anything on your roof you will notice a little extra drag and your fuel consumption will go up. This is worse if your Roofbag car top carrier is not fully loaded. It is also important to be aware that the straps which go inside your car will get wet when it rains; leading to drips inside your car. This car top carrier is the first on our list to be solid instead of a soft material. There is no doubt the Yakima Skybox is a stylish looking piece of kit; the wind should effortlessly glide over it. This shouldn’t really be a surprise as Yakima is one of the world’s leading manufacturers of car top carriers. This cargo box weighs 75 pounds and measures 90” x 36” x 11.5”. It can handle a huge amount of gear. Skybox 16 – This has a textured finish and 16 feet of cargo space. It will hold 185cm skis. Skybox 18 Carbonite – This offers 18 cubic feet of space and holds skis of 215cm length. Of course, you’ll need a larger car to accommodate it. Skybox 21 – Unsurprisingly this gives you 21 cubic feet of space, but it still only accommodates skis up to 215cm long. Skybox 12 – This is the smallest of the range and offers just 12 cubic feet of space with a long, narrow design. It can still accommodate skis of 215cm in length. Skybox Lo Carbonite – You’ll get 15 cubic feet of space and still fit skis up to 215cm long! The Skybox has a sleek and low design, this helps with aerodynamics, reducing drag while driving and therefore minimizing extra fuel consumption. It is also a benefit if you’re trying to keep the cargo box on while putting your car in the garage; there’s a good chance you’ll be able to do it. A great feature of the Skybox is the fact that you can open it from either side. This makes it easy to get to your gear no matter where you’ve parked or who has blocked one side of your car. Included with this car top carrier are SKS locks; the best currently available. These combine with an overhead locker style handle to create an effective locking system. The security is complemented by lid stiffeners and a rigid base to help ensure your gear is safe; even when left overnight. It’s worth noting that the handle must be in the horizontal position before you can lock it. It moves into position with a loud click; ensuring you know it is closed. The cargo box also locks to your roof rails to ensure it is both secure and cannot be easily stolen. You can drive a long distance in confidence; your belongings will remain where you left them. You will also appreciate the limited lifetime warranty that comes with the Skybox. As long as you’re the first owner it will be covered by warranty. This is not transferable to a second owner. Any of the Skybox range can be fitted to your car, whether you have factory fitted roof bars or an aftermarket rack. The biggest issue seems to revolve round installing the roof box. Although the instructions appear to be very detailed they do not adequately cover the whole process. As a consequence you can spend a lot of time fitting this car top carrier before you are happy it is on properly. This may not be an issue if you put the box on and leave it on but, if you are hoping to just put it on when you need it you may find this extremely frustrating. There have been a few incidents of the box coming undone in transit, however these are isolated and he same can be said for the majority of car top carriers on the market. IT’s a downside but not one that should affect your decision to buy this box. 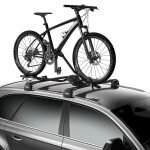 Thule is one of the biggest names in the cargo box industry and with good reason. 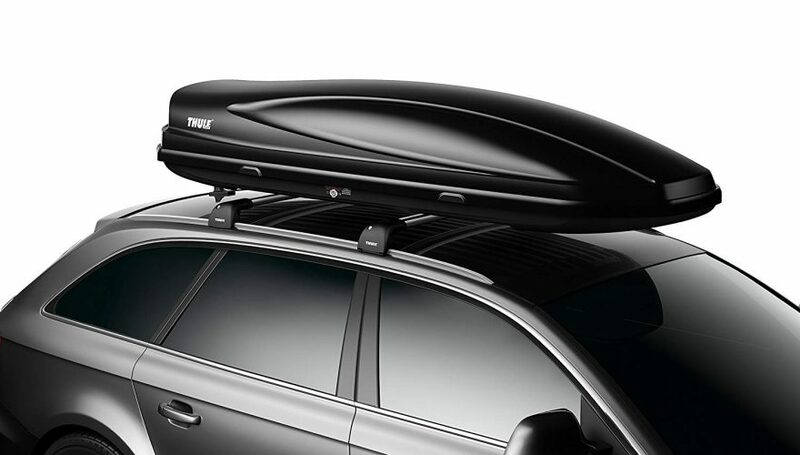 The Thule cargo box has been tested over many years; each new design demonstrates an improvement on the one before. 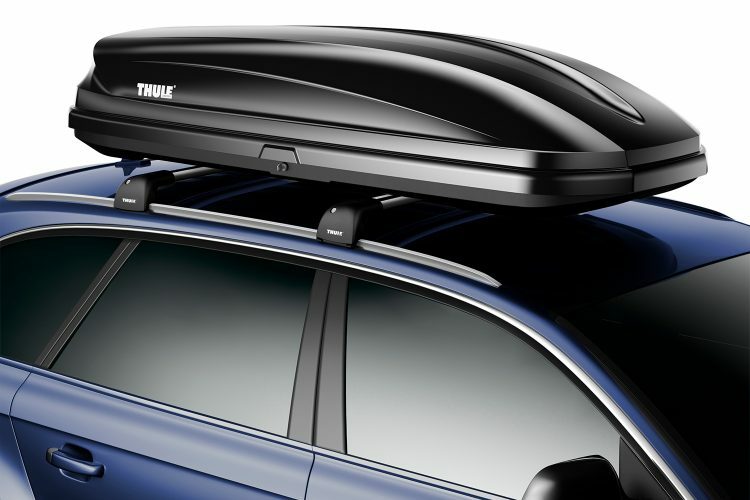 The 628 Thule cargo box is 74 inches long by 36 inches wide and 16 ½ inches tall. It weighs 39 pounds and you may want to have an extra pair of hands handy when installing it. Internally you’ll have 70” x 34” x 13 ½”. It can handle weights up to 110 pounds; just be sure that your roof can too. It is also important to be aware that your crossbars must have between 23 5/8” and 33” between them; otherwise, it won’t fit. The Thule cargo box has a ribbed surface inside which will help to prevent your items from being moved round even if the box is not full. This is a great addition and one that is often overlooked in other products. 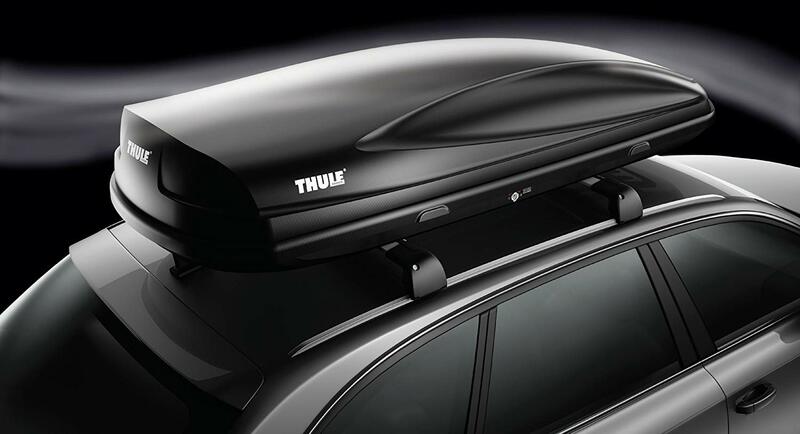 The lid on this Thule cargo box can be opened from either side. This means you never have to worry about being in the way of traffic or not having enough room to access your luggage. It is also good to know that the 628 can be fitted to any style of roof bars; whether factory fitted, round, square or some other design. The Thule cargo box has a locking mechanism built into it; you’ll receive two keys. It is not possible to remove the key unless you’ve locked the box. This should help to give you peace of mind as you drive. The lock is large enough that you can grab it even if you’re wearing gloves. Inside the box are four quick grips fasteners which lock into your roof bars from the inside of the box. This ensures the box cannot be removed without first unlocking it. It is advisable to do the rear two fasteners first; no tools are necessary. This level of security should help you feel confident about leaving your Thule cargo box attached to your car while you sleep. The skin of this box is diamond textured; this encourages air to flow over the Thule cargo box, reducing drag and excess fuel consumption. This also helps to ensure the box is durable in all conditions. There have been reports of the front of the box opening very slightly while driving. In wet conditions, this can be enough to allow the rain in and soak your luggage inside. This is an issue that only seems to appear in heavy rain but one that is worth being aware of; especially considering the price of the Thule cargo box. The hinges on this box also seem to be a little on the flimsy side which is a shame when you consider how well the rest of the box is made. You’ll need to open and close it with a little caution to ensure that they don’t break. The SportRack offers a simple, more traditional design than many of the other solid cargo boxes on this list. However, that doesn’t make it a poor design; in fact, this is potentially one of the best value car top carriers on this list. The cargo box measures 63” x x38” x 19” and weighs 28 pounds. It gives an impressive 18 cubic feet of space although there are a few small issues with it. 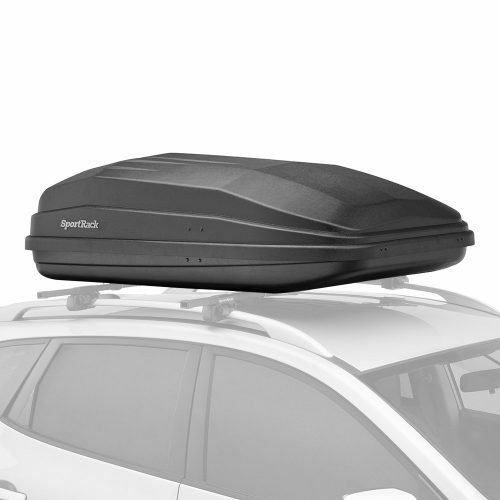 The SportRack cargo box is made from ABS; this ensures it is both durable and offers you a good level of protection against UV rays; after all you don’t want your clothes fading while you drive across the country. The finish is a cross between shiny and matt, perhaps to help prevent it from looking dated. The box opens at the rear, eliminating the problem with dual hinges while keeping you safe from traffic on either side of your car. You can even stand on your rear bumper to facilitate access. Included with this cargo box are U-bolt mountings. These slide around your roof bars and into the box. The nuts are then added to the U bolts and tighten into place. Not only will this hold the box firmly in place as you drive; it will also prevent anything from stealing the box unless they can first open the lid. There are multiple holes in the base of your cargo box to ensure it will fit onto any size or shape bar; although this may leave you wondering just how waterproof the box is. It is important to note that during testing the cargo box seemed to keep water out, it is certainly rainproof. But this doesn’t mean it will be able to keep all moisture out. You will be better finding an alternative home for your electrical belongings. 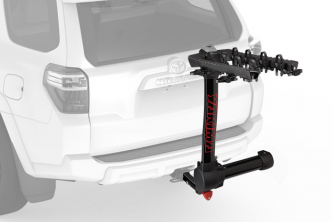 The U bolt system does make it very easy to install the cargo box on your =vehicle; it won’t even be a chore if you are often taking it on and off. Again you’ll find you have 2 keys to access the box, a simple lock on the back is enough to secure the box and keep your belongings safe. Again, you’ll need to have the box locked before you can remove the key; this reduces the likelihood of driving off with the box open. One issue that immediately came apparent is the rear opening design. The issue here will depend on the vehicle you are driving. If you have a small SUV you may not find it an issue but bigger vehicles will make it impossible to reach the back corners of the cargo box. You’ll either need to carry a step ladder with you or perhaps hang off the side of your vehicle! The lid of this box is also concerning; it appears to be very flimsy in construction. This means it has the potential to be pulled off when opened in high winds. It is worth noting that a few people have complained about rain getting in and wind noise when driving. However, this does not seem to be the norm. The Rightline Gear 100S30 Sport 3 is a return to the soft cargo box option. The design is certainly not revolutionary; it is simply a square box designed to fit on your roof. Of course, this does have the benefit of making it easier to pack suitcases and other straight-edged objects. The bag is designed to hold 18 cubic feet and measures 48” x 40” x 19 inches high. It weighs 8.6 pounds. This soft cargo box can be fitted to any roof. If you have roof bars already fitted to your vehicle then the Rightline Sport 3 will slot between the bars. The strong straps secured to the cargo box can then be tied around your roof bars. There are two straps on each side. Providing you get the knots nice and tight the cargo box will be secure. Alternatively, you can use the car clips provided to secure the cargo box to the door frame of your vehicle. Simply open the door, position the clip and adjust the strap to ensure it is tight. The door should close normally. It may be with considering adding a nonslip mat to the roof of your car and you’ll need to verify the maximum weight your roof can support. The Rightline cargo box is made from Hydrotuff. This is 600 deniers woven polyester with a PVC inner layer and a PVC coating. This allows it to remain lightweight while being tough enough and durable enough to withstand any weather you may drive through. It also utilizes reinforced polyester mesh, (to strengthen the cargo box), a corrosion proof zip and a zipper flap along with dual seams. These factors combine together to ensure the rain cannot enter your bag while it is being used. This makes it 100% waterproof. Even the waterproof flap has a zipper to ensure the main zipper is protected. This approach also ensures the UV rays can get through your bag and onto your products inside. There are also pulls on the zippers which can be used to lock the bag closed or even lock it to your roof; providing you have bars or something similar to lock it to. It is worth noting that the bag unzips 3/4‘s of the way around; you can then roll back the top and gain easy access to the packing space. This is handy for loading and unloading. You even get a handy drawstring bag to fold the cargo box into when you’re not using it. That way you’ll always know where it is. A top tip regarding the straps s to twist them when tying your cargo box down; this will help to eliminate any wind noise, leaving them flat will ensure they make a whining noise as you drive. 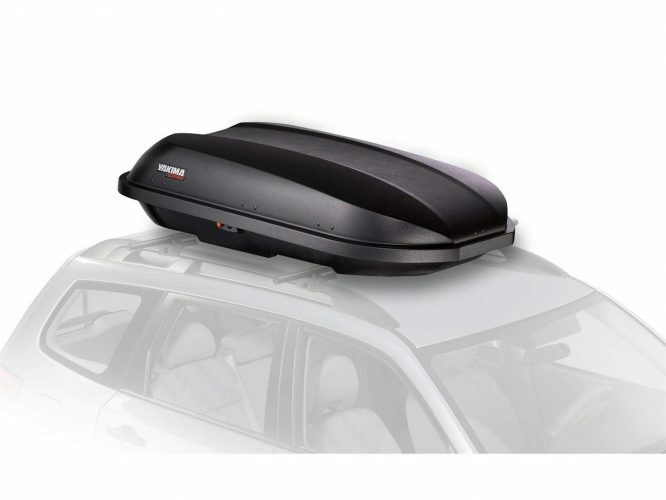 This is guaranteed to be waterproof but it is important that you put this car top carrier on your roof the right way round! If you don’t then it is possible that rain can get in; especially if you don’t use the zip cover. As with most sift cargo boxes it is important to make sure the front corners are full. If you don’t the material is likely to flap in the wind as you drive; which will be annoying. This is one of the best budget buys on this list but it doesn’t make it any less of a cargo box. It has a stylish design which could be said to have copied the Thule cargo box. The finish is matt black and a little dull which prevents it from quit achieving the style of the Thule. It measures 63” long by 39.4 inches wide and 11.8 inches high. That gives you a lot of space inside for your belongings. It is worth noting that it is one of the heavier options on this list, weighing in at 53 pounds. The box is designed to sit on any style cross bars. This means you can have a factory fit, aftermarket, square or round ones. But they do need to be cross bars, not just the side bars. To secure it to your roof bars you slide the hooks on the underside of the box under your roof bars. Then reach inside the box and tighten the red knobs until the box is securely in position. Of course, while this helps to ensure the box is securely locked to your roof bars it does nothing to ensure the bars are securely locked to the car. The locks used are SKS which should give you peace of mind. As with most of these cargo boxes it is not possible to remove the key unless the box is properly locked. The Yakima Rocketbox has a lock on the side of it. Simply turn the key and then push the button to release the lid. This is a simplistic design but may prove to be problematic if the button should ever fail. The lid can be opened from either side via the dual hinge system. This is great for access in any situation and a definite plus for this car top carrier. You’ll also benefit from a lifetime warranty although this only applies to the first purchaser; the warranty is not transferrable. The design is relatively aerodynamic and the box is firm enough that wind nose does not seem to be an issue. There is also a negligible effect on your fuel consumption. It may also be beneficial to note that it can accommodate skis up to 180cm in length. Although generally well beat there is some credence t the idea that you get what you pay for. Several users have reported issues with the supporting arm; it simply comes off. In theory and according to Yakima the arm should just clip back into place but this is not as easy as it may appear to be. The roof of this cargo box is a little on the flimsy side, without the arm the box is even more flimsy. This will make it difficult to get your gear or out without the lid closing on you. While most users are happy with the Yakima Rocketbox there have been a few issues with the opening buttons not working properly and the jack in the box style springs making it difficult to close both sides of the box properly. This roof bag offers an impressive 15 cubic feet of space and yet it can be folded up and stored when not in use. It’s incredibly practical and stylish. It’s important to note that, unlike some of the bags on this list, the Vault is designed to fit on your roof bars or directly onto your roof. It measures 44” x 34” x 17” and weighs just under 7 pounds. 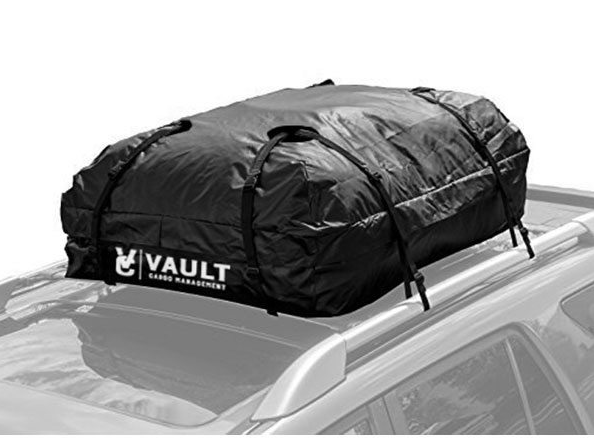 The Vault car top carrier comes with ratchet straps and lashing straps. This makes it possible to ensure it is effectively secured to your car. The cargo bow is made from heavy duty canvas which is specially treated to ensure it is waterproof. It also offers a good degree of abrasion protection; helping to ensure your belongings arrive in the same condition as when you left. This Vault car top carrier has a double zipper with zipper flap. This will help to ensure the rain cannot get into your luggage and allow you to lock the two zips together. It may not be enough to deter every thief but it will help! You may also be surprised to discover that this car top carrier actually comes with a roofing mat. 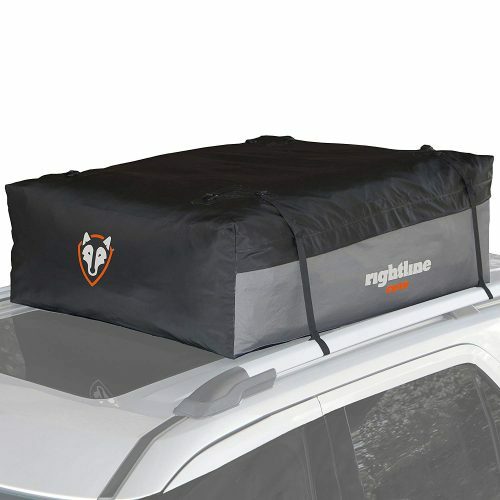 This offers protection for your roof but also helps to prevent the cargo box from moving round while in use. There are 2 straps on each of the sides of the cargo box. This is one car top carrier that should not be able to move at all if you use all the fastenings. Certainly, this seems to be the general consensus from existing customers. As already mentioned the Vault cargo box can be folded when not in use. It reduces to approximately 12 inches by 12 inches; that’s pretty easy to store anywhere or even carry in your car for emergencies. Of course, being made from material you will need to remove the contents and preferably the cargo box overnight; unless you feel you’re in a very safe area. It is simply too easy to slash the fabric and get to your luggage. It is worth noting that the actual description is water resistant, not water proof. The general consensus is that the car top carrier stands up well even in heavy rain. But, you should be aware that it is only described as water resistant; you can’t go swimming with it. There have been several reports regarding the bag fraying after long road trips; in excess of 1,000 miles. This is potentially due to the stresses placed on the material; particularly if the bag is not full and there is the opportunity for the material to flap. Considering the price range and design of the Vault cargo box this is not a huge flaw, but it is one you should be aware of. You also need to verify that the stitches are good on all the straps. There have been a few incidents when the straps are poorly stitched on and have come off on the first use. This appears to be an issue with just a handful of the cargo boxes, but it is worth checking before you first use it; you will save yourself hassle if you wish to return it. Pulse Alpine – Its 88.5” x 25.5” x 12.5” and offers 11 cubic feet of space. Maximum load is 110 pounds and you can fit in 4 – 6 pairs of skis or 2-3 boards. It weighs 30 pounds and offers a maximum ski length of 210cm. Pulse Medium – This is shorter but wider and deeper at 67” x 35” x 16” and 14 cubic feet of space. Again it will handle 110 pounds and 3-4 boards. But the maximum length of your boards is 155cm. It weighs 34 pounds. Pulse Large – Unsurprisingly this is the largest although still shorter than the alpine. It measures 76” x 33” x 16.5” and accommodates skis up to 181cm. You can fit 6 – 8 pairs of skis or 4 boards and it weighs 36 pounds. 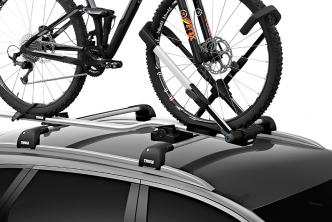 It should come as no surprise that the Thule Pulse is extremely durable. It is made from ABS plastic to ensure it can handle almost any blow. The material won’t distort no matter how fast you are going and the lid is lipped to ensure the rain is carried away from the base and your belongings. This makes it very waterproof. The Thule car top carrier opens on the passenger side; allowing you plenty of access to your belongings while staying safe. When closed it has a standard Thule lock that will help to protect your belongings no matter where you leave them. 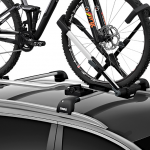 You’ll find the Thule roof bars can also be locked to your car; ensuring the safety of your belongings. However, this cargo box can also be attached to factory bars; whether round or square. This is great for convenience but may reduce the security of your car top carrier. With the box open you’ll notice that it incorporates an easy fit system. Simply position the fittings over the roof bars and tighten them into position. The knobs are oversized to facilitate use even in inclement weather. All the Pulse boxes are designed to fir close to your roof; improving the air flow over your vehicle and reducing drag. It will help to minimize the extra fuel you use. In fact, it is aerodynamic enough that it should create no additional noise when driving. There are also lid lifters. These help to support the lid as you open it, making the process easier. They also hold the lid in position until you’re ready to close it. You can simply pull the lid to close it; the lid lifters will automatically disengage and guide the roof into the correct position. You’ll then be able to lock it but you can’t remove the key unless it is properly locked. 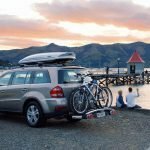 Thule is one of the leading suppliers of car top carriers and as such it is not surprising that you’ll find very few problems with the Pulse. 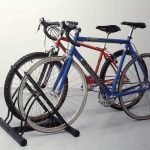 It is worth noting that this one of the more expensive options on the list but it is backed by a good warranty and reputation. There have been a few issues with the level of customer service and the quality of the cargo box in comparison to ones much cheaper. But, in general, Thule are very good at dealing with issues and getting the product right. This can be classified as the top performing car top carrier on this list. The Whistler car top carrier bundle comes with one soft cargo box, a non slip roof mat and a storage bag. You don’t need a roof rack or bars to add this to your vehicle and it offers an impressive 15 cubic feet of extra space. It should fit absolutely any vehicle as long as you have 4 doors; this is to enable the straps to go through the car. 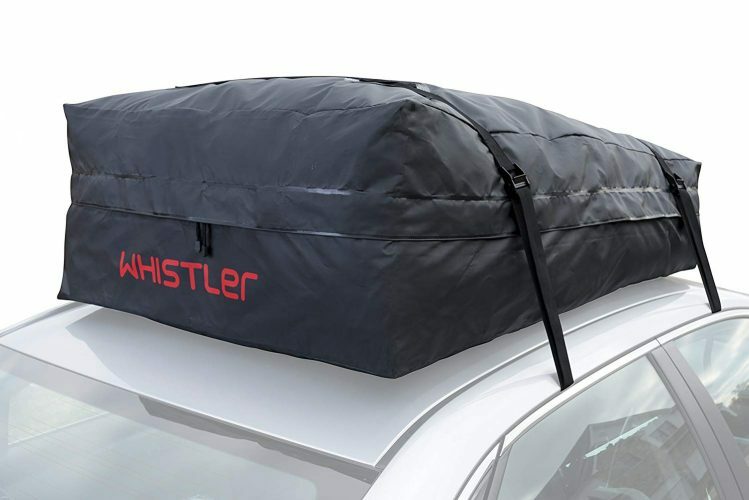 The Whistler car top carrier weighs just 10 pounds, can be folded up when not in use and offers an impressive 44” x 34” x 17” when on your roof. The anti skid matt is perfect to protect your roof and stop the cargo bow from moving while in transit. The straps are pulled through the open doors of your vehicle and attached together with cam buckles. You can then adjust them to ensure they are tight before closing the doors. They shouldn’t need to be adjusted during the journey. The straps are solid as they are 2 inches wide. The Whistler also features a double zip system which allows you to lock the two zips together. Once closed the zips are covered by an extra piece of material which is joined with Velcro. This ensures the water cannot get in, no matter how heavy the rain. The cargo box itself is made from heavy duty canvas and tarpaulin which has been treated to ensure it remains water proof throughout your journey. This is designed to ensure your items are protected and the material is strong enough to withstand repeated use. It is also impressive to find that this car top carrier comes with a one year, no quibble guarantee. If you’re not happy for any reason then you’re entitled to your money back for up to one year without any questions asked. It is worth noting that the metal cam buckles are reinforced and make it very easy to install the roof box. You should be able to do it in just 5 minutes. You will also be pleased to note that, providing you ensure there are items in the front corners; there is no additional road noise when using this cargo box. In fact it is happy at speeds of up to 85mph; if your local laws allow you to drive this fast. As with any car top carrier that fastens through the car you will have an issue with dripping water in the rain. When you drive in heavy rain the box and straps will become saturated. While your belongings inside the car top carrier stay dry; the water travels down the straps and drips into your car. This is not necessarily a reason not to buy the box but you do need to be aware of it and prepare with some towels; just in case. Interestingly there have been several customers that state how poorly made the bag is; as it has tripped apart on them during their drive and allowed water in. However, Whistler seems to have acknowledged there are a few defective bags in circulation and is looking after anyone who has received one. The first thing you need to consider is what will you be carrying and how much space will this take up? This will help you to decide if you need an 11 cubic foot car top carrier or 16 cubic feet; or even a bigger one. When you consider the volume you need don’t forget to consider what you’ll be loading. Car top carriers come in a variety of shapes and sizes. If you want to include skis in the load then you need to have one that is long enough; even if it is not a wide one. Don’t forget that it is possible to add two cargo boxes to your roof if needed, side by side. But, you can’t stack them on top of each other and you do need to observe the weight limit for your roof. A roof box should be an investment for several years. This means that you can justify spending a reasonable sum of money on it. However, it is still important to consider the funds you have available and how much you can really afford to spend on a car top carrier. Knowing your budget in advance will help to ensure that you only look at those in the right price range. While it may be nice to look at the top end ones it will make it much harder to pick the most practical and affordable option for your needs. There is no reason why you need to borrow funds in order to purchase one of these boxes, simply set your budget and choose the best box you can find in that price range. Of course, you should also consider the other factors and perhaps increase your budget; if necessary. You also need to consider how much you will be using your cargo box. While it can look and feel great to have the most expensive car top carrier mounted on your roof; you have to wonder if it is worth it when you’ll only use it once. If you’re looking for a car top carrier to help you move or just for the annual vacation then you may need to stick with the budget options. Of course, if the cargo box is going to be used a lot and even live on the roof of your car then you’ll need to look at the solid boxes as opposed to the bags. They are more likely to stand the test of time of you’re using it over and over again. It doesn’t matter if you’re a single woman or a man mountain. You need to be able to lift the cargo box onto your roof and fit it easily. This means you’ll have to pay attention to the fittings. It is very simple to wrap the straps of a soft cargo box through your vehicle. However, you’ll have to ask whether you can pull them tight enough or not. Equally a solid box should clamp onto your roof bars. But, if you don’t have permanent roof bars you’ll need to think about how easy they are to fit and then how easy it is to add the roof box onto the bars. The Thule cargo box is generally the easiest to fit as it has large knobs inside the box to facilitate tightening it into position. But, these are solid boxes which are generally heavier and may be more difficult to loft into position. You’ve already considered how heavy the car top carrier is but you also need to consider how much weight your roof can take and how much weight the cargo box is designed to take. Don’t forget when considering the weight your roof can handle that the roof box can also weigh several pounds. If you’re choosing a soft cargo box then it is worth looking at the spec of the box to see how it deals with odd shaped items and the distribution of weight across the bag. You should also consider how easily the box can be folded and stored. You may want to keep it handy for future use. You need to read reviews like this to discover the best car top carrier on the market. But, it is also important to consider the reputation of the manufacturer. There are some, such as Thule that has been producing these luggage carriers for years and has developed a good reputation. There are others that are newer to the scene and you may not know what their reputation is like. This is when social media can be extremely useful. It is a good idea to look at the comments regarding the car top carrier you want to buy. There should be a whole range of honest opinions which can help you to choose the right box. You’ll even be able to ask specific questions to people who have the cargo box you want to get. However, it is also important to note that it is unlikely every consumer will be happy with a specific product. There will be defects and issues when the cargo box does not do what they thought it would. In these instances, you need to ensure that the majority of the comments are positive. You may even be able to assess the manufacturer’s response to the unhappy customers. The majority of the hard car top carriers on the market can be fitted onto square bars, circular and almost any other type. However, you should verify this before you purchase a car top carrier. Some of the bags do not even need you to have roof bars. This will save you money when purchasing and may be the best option if you are only using it once or occasionally. However, if you have roof bars and need crossbars then it is important to make sure you choose the right ones for the cargo box you wish to buy. A solid car top carrier should be designed with a curved front. It may rise slowly in size or simply run straight back and then taper at the end. The point is that solid roof boxes are generally very aerodynamic. The more aerodynamic the box is the less drag it will create. Less drag equates to a smaller difference in fuel consumption. The higher the drag the more fuel you’ll lose. If you’re doing a lot of miles then you may prefer the economy of a hard car top carrier. The soft bag options are also more likely to make noise. This can generally be avoided by making sure the front corners of the bag are fully loaded and won’t move. But; again; if you will be using it a lot you may prefer the hard option to avoid noise issues. Finally, before you purchase your car top carrier you need to consider what else goes on your roof. For example, if you enjoying kayaking on a regular basis but intend to keep your cargo box on; then you’ll need to purchase a skinny and long car top carrier. This will ensure you can still fit your kayak and benefit from the extra space of a car top carrier. Of course, if you’re never likely to carry the two things at the same time you may not think it is worth considering. But, the issue is that you never know when it may actually be helpful to have both items on your roof. The bottom line is that there is no one car top carrier that is right for everyone. The 10 on this list are some of the best available at this moment in time. But, to choose the right one for your needs and your current situation you must consider the points aid out above. You’ll then be able to identify whether you need a soft cargo box or a solid car top carrier. It is then a relatively simple step to look at this list and select the size and shape that will suit you best, along with how it fits to your vehicle. If possible you should buy your roof box as early as possible; budget allowing. This will give you plenty of time to inspect the item, understand how it fits to your roof and even test it several times. If you’re planning a big trip then it is much better to go with something that you’ve tried and tested; it will remove some of the stress from the trip.